Some of my favorite horror movies come out of France. For example, there’s the more modern horror flick High Tension, but also a more classic example like Eyes Without a Face. That’s what brings us to the French horror/dark comedy Sheitan. I was first interested in this movie when I saw that Vincent Cassel was playing the psychotic villain, a role that I have yet to see him play to this degree. Developed by an underground group of French videographers, Sheitan is a movie that is made exactly how the developers wanted it to be made and without any major interference from studios. The end result is something disturbing, hilarious, and unique. While at a Parisian night club Bart (Olivier Barthelemy), Ladj (Ladj Ly), and Thaï (Nico Le Phat Tan) meet two girls, Eve (Roxane Mesquida) and Yasmine (Leïla Bekhti). After Bart gets kicked out of the club, Eve invites everyone back to her family’s mansion in the country where they can continue the party for as long as they want to. Upon their arrival, the group meets Joseph (Vincent Cassel), the groundskeeper that tends to the house for Eve’s family. As the day goes on, Joseph introduces the group to the people of the village who are all some sort of demented, but things get even weirder that night when they all go home for dinner and it becomes clear that Joseph has something sinister in mind for all of them. This is one hell of a bizarre movie, and for that reason I give it a lot of credit. It’s a great blend of horror and comedy while still sustaining an ominous atmosphere throughout its entire run time. The story is told in a very weird way, which I will return to later, but I was compelled to stay with this movie until the end. Sheitan slowly but surely leads you on and drops a few clues here and there as to what Joseph has up his sleeve for the unsuspecting group of friends. That being said, this movie also works as a mystery of sorts because the whole time I was trying to figure out what the hell was actually going on. When I finally figured it out, it was so rewarding because I got to see my theory play out in front of me. 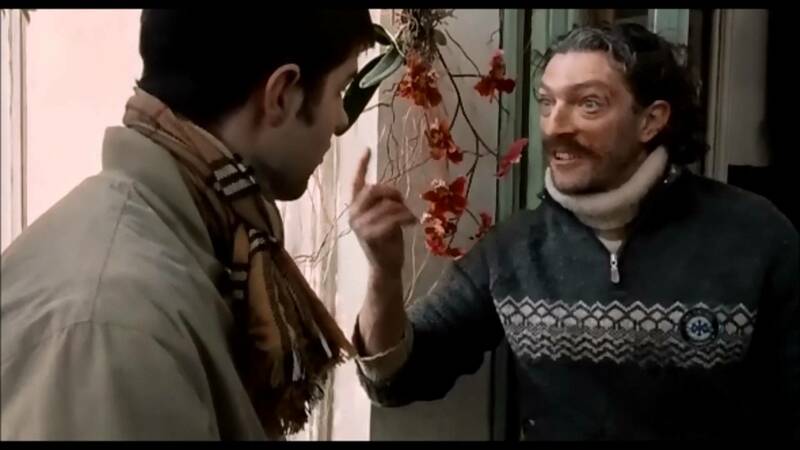 Like I said, one of the main reasons I wanted to watch this movie was to see Vincent Cassel act like a lunatic, and he sure delivers a memorable performance. In fact, I might say it’s one of my favorite horror performances. There are times where I no longer saw Cassel, but was sure that the character of Joseph had completely taken over. 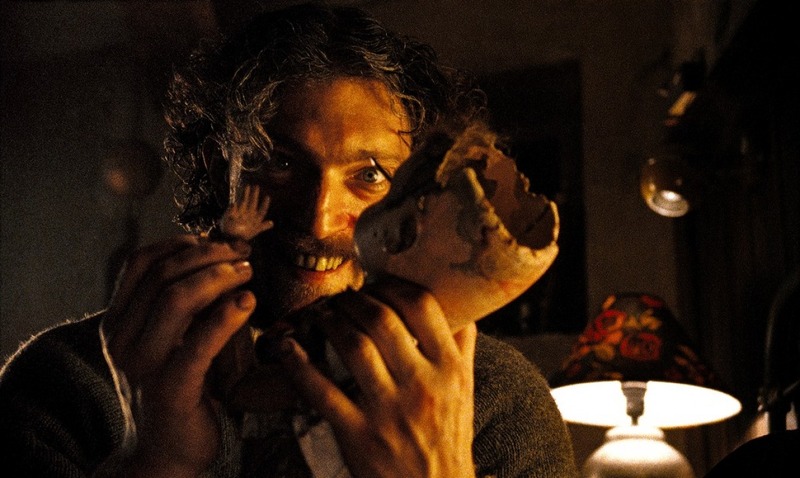 The constant smile that is smeared across his face is made even more eerie by the face crooked teeth Cassel wore for filming. Much like the entirety of Sheitan, Cassel is both horrifying and hilarious. I also have to give credit to the rest of the cast for adding an extra layer of character. Each person felt different and important to the story. Now, the way the story is told felt very odd. It seemed like for a very long time, nothing was really happening. In fact, the movie only starts getting really intense during the third act. This was both a good and a bad thing for me. It was good because it made me feel like I was being led along this dark, winding path to some conclusion that I couldn’t even imagine. On the other hand, I started to feel just a little bored towards the middle of the movie. I’m still pleased that the film makers decided to take their time telling the story. Even though there were some boring moments, they never bogged the movie down and I feel like they still helped create a feeling of suspense that made me have to know what happened next. Without knowing anything about it before watching it, I can say that Sheitan is a wonderfully underrated movie. It doesn’t even seem to have garnered a cult following, even though it definitely deserves one. 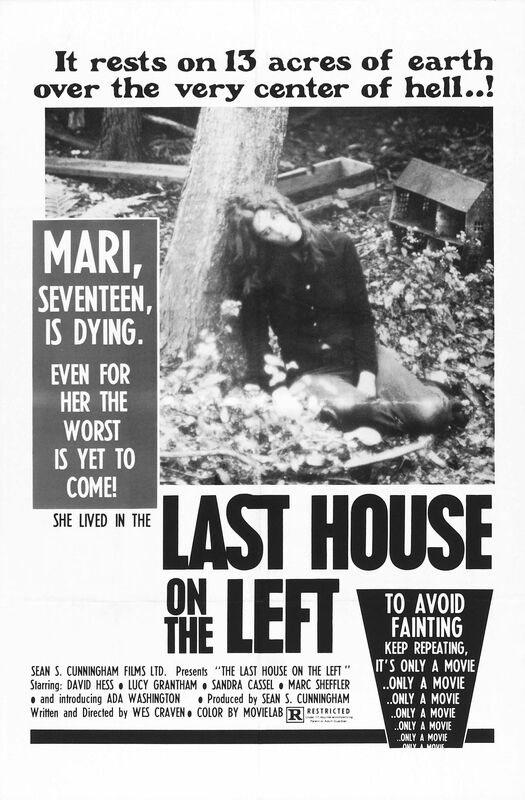 It not only works as a grotesque piece of horror, but also a dark comedy full of complete lunacy. The art design and cinematography was even impressive. To all the horror fans out there who are looking for something off the beaten path, Sheitan may be just what you’re looking for. I know I’ve said this before, but thrillers are difficult for me. I either love them or I hate them. Most times, thrillers have an excellent plot with lots of suspense and memorable twists. Unfortunately, a lot of the time they also succeed in boring me due to convoluted narratives, derivative characters, and a lack of…well… thrills. Marathon Man had the ability to be an excellent thriller, but due to a ridiculously messy job at pacing and story set up, I was only minimally entertained. Thomas Levy (Dustin Hoffman) is a graduate student studying history in New York City and his brother Henry (Roy Scheider) is an agent for a secret government organization. Both of their lives are completely separate. Or so they thought. Enter Dr. Christian Szell (Laurence Olivier), a nazi hiding in Uruguay, and has come to America to collect a fortune of his that was acquired during World War II. 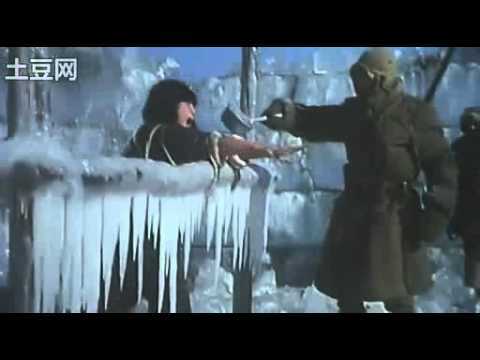 Szell is paranoid that Henry is going to try to rob him of his diamonds, so his reasoning is to go after both Henry and his innocent brother Thomas. Now Thomas is up against a for he never thought he’d have to face, with very little help from his supposed allies. Let’s go through this movie step by step. First off, it is known that all of the main players are masters of their craft. Olivier was nominated for an Oscar for Best Supporting Actor, but the real powerhouse performance is that of method actor Hoffman. While these performances are great, I can’t say the same thing about the first hour of the movie. We spend a lot of time with Scheider’s character and building up the paranoia of the main plot, and also building up Hoffman’s character and his relationships. 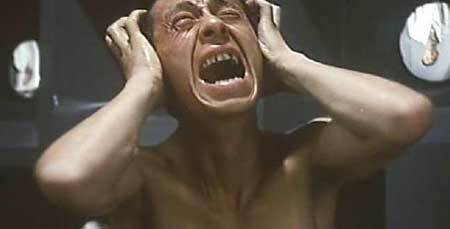 Unfortunately the time spent with Scheider is pretty dull and presented sloppily. The only thing really interesting about the first hour’s scenes with Dustin Hoffman is his acting. He’s very natural and brings a lot of life into a character that isn’t extraordinarily interesting. You know what else isn’t extraordinarily interesting? The relationship that builds between Hoffman and Marthe Keller. I understand that not every relationship in a movie has to be the most special thing I’ve ever seen, but it should be somewhat interesting. This one was as derivative as could be. Scenes building their relationships seemed to take a while and weren’t too fun. There is a point when the story does pick up, and pick up it does. The last hour of this movie is absolutely awesome. While I was watching it, I kept thinking to myself, why couldn’t the rest be like this? From the unflinching torture scene that will make you dread the dentist even more to the scenes of Olivier seemingly surrounded by aware Jewish men and women on the streets of NYC. This is where the thrills finally show up. Better late than never, right? Wrong. I shouldn’t have to sit through an hour just to get to the good stuff. The entire movie should be good. I don’t negotiate with entertainment. It’s safe to say that I wanted to like Marathon Man a lot more than I did. It claims to be a thriller, but I’d consider it half of one. The first half of the movie feels both dull and disjointed, while the second half held my attention until the conclusion. Like I said before, I shouldn’t have to wait an hour to get to the thrills. I understand the need for character and plot development, but at least keep it interesting. If the pacing was as good as the performances, the movie would be great, but instead I can only call this a mildly entertaining thriller. The next two reviews of mine are going to be on the longer side since I’m going to be reviewing the Hellraiser series in bulk, you could say. There are nine films in this series with four of them getting theatrical releases, and the rest being direct to video and DVD releases. This is also a perfect example of the studio system making a mess of a story with so much potential and relevance and turning it into a load of derivative drivel. 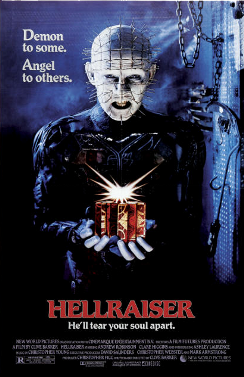 What better place to start than with the original 1987 film, Hellraiser. When an antique puzzle box is stumbled upon by a scumbag, Frank Cotton (Sean Chapman), a portal to hell is opened releasing the masters of pain and pleasure, the Cenobites, to bring you into a world of torture and suffering that has never been experienced before. When Frank’s extended family move into the house that was used as the portal, Frank is brought back to life. Now relying on his former lover and wife to his brother, Julia (Clare Higgens) to bring back humans for feast on an regenerate, his niece Kirsty (Ashley Laurence) once agains opens the puzzle box. The Cenobites want her, but after learning her uncle’s secret, Kirsty is prepared to make a deal with the Lead Cenobite (Doug Bradley). This is a unique horror movie that blends psychosexuality, gore, and pure terror into a narrative filled with its own interesting mythology. The first time we see the Cenobites pulls us into the story in one of the best prologues to a film I have ever seen and when we hear more and more about them, the interest grows and gets the viewer excited for the sequel, but we’re not there yet. I really don’t have any complaints about this movie other than the acting at times. Doug Bradley and Clare Higgens knock their roles out of the park, but the rest of the cast is less than stellar. One other noteworthy performance is Oliver Smith, who plays Frank when he comes back to life and is nothing but muscle and bone. Everything else is excellent and has marked Clive Barker as one of the masters of the horror genre whose name should be synonymous with Wes Craven and John Carpenter. In 1988, a sequel was released. 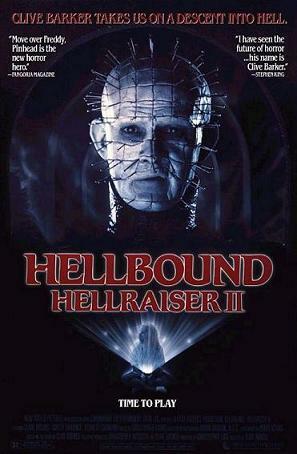 This was Hellbound: Hellraiser II. Soon after the events of the first film, Kirsty wakes up in the Channard Mental Institute led by the mysterious Dr. Channard (Kenneth Cranham). Unbeknownst to everyone, Channard has a strange obsession with the puzzle box called the Lament Configuration, which was used to summon the Cenobites before. He soon opens the portal to hell allowing himself, a resurrected Julia, Kirsty, and patient Tiffany (Imogen Boorman) to enter the twisted underworld of ultimate pain and ultimate pleasure. While Clive Barker still acts as a producer for this film, it is a lot different than its predecessor. First off, one can’t help but notice the implementation of a bigger budget. Stepping into hell does cost money after all, but I can’t help but miss the impressive simplicity of the original Hellraiser. The audience is still treated to more pools of blood and gallons of gore, which is always great. 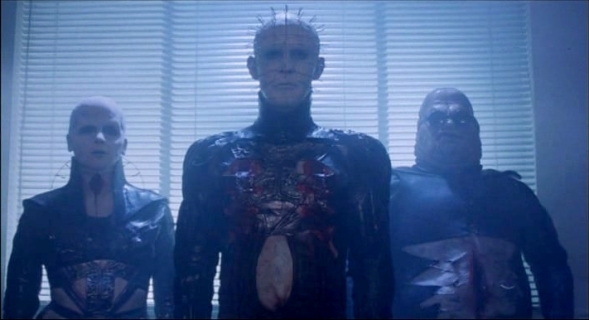 In many sense, Hellbound: Hellraiser II is a step up from the first, but in other ways it isn’t quite the same experience as the first. It gets bogged down in special effects and I don’t really get the feeling of a strong cohesive story, rather it seems more episodic. Still this is a worthy entry into this series, and certainly better than the train wreck of a movie that is Hellraiser III: Hell on Earth. 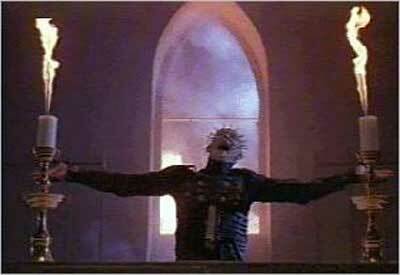 After the events of the second film, “Pinhead” (Doug Bradley) finds himself trapped in the Pillar of Souls with his only escape being to absorb the souls of others. Enter reporter Joey Summerskill (Terry Farrell), who is tracking the activities of the Lament Configuration. Once enough souls have been collected, Pinhead is released and begins to wreak havoc on earth, recruiting other cenobites in the process. This is the worst movie of the series. It is truly a disaster in every respect. First of all, the acting is beyond awful, causing me to laugh at the most inappropriate of times. Second of all, Pinhead acts like Carrie when he gets out, just killing everyone in the room. This is very out of character, and doesn’t work at all. Finally, the movie turns into a joke in the third act. The cenobites are a bunch of wise cracking assholes with what seem like super powers. What happened to the chains? I guess it just wasn’t cool enough. 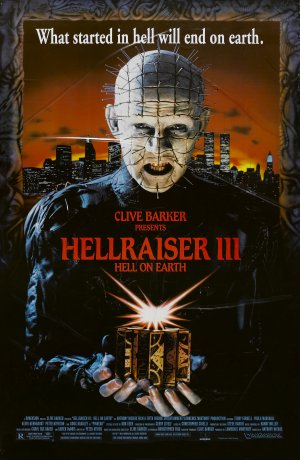 This is the movie where Pinhead gets his name, and Clive Barker has come out and said he hates the nickname. This is an immature excuse for a horror movie that doesn’t hold a candle to the previous films, or even most of the other films in the series. It’s a chore to watch, and it’s unfortunate that to understand everything in the next installment, you need to see this one. Luckily, redemption can be found in Hellraiser: Bloodline. Past, present, and future blend in Hellraiser: Bloodline. The history of the Lament Configuration is explained with its creator being a toymaker in the 18th century, and then follows this lineage to the year 1996. John Merchant (Bruce Ramsay) is the descendent of the toymaker and is targeted by the demon Angelique (Valentina Vargas) and Pinhead (Doug Bradley). Finally, in 2127 on the Space Station Minos, the final descendent has a one on one battle with Pinhead while the rest of the crew have to deal with the hellish cenobites. This was a very enjoyable entry for me. I had a great time seeing the progression of the Lament Configuration from its beginnings to humanity’s last stand against the cenobites. This felt like a pleasant return to the Hellraiser series. 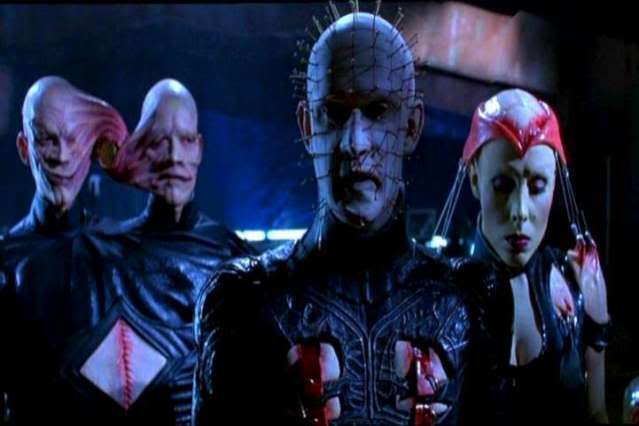 Pinhead gets a much larger role, and arguably has some of the best lines (“I AM PAIN!”). The cenobites also look a lot better and certainly not the joke they were in the third. 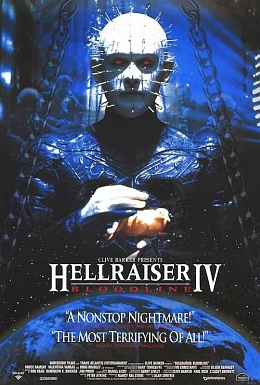 After the first film, I think Hellraiser: Bloodline is my favorite. There’s a lot going on forcing the plot to keep moving, and the whole story in space doesn’t feel cheesy or forced. This is what the Hellraiser series is about and I strongly recommend it. This is all of the Hellraiser films that were released in theaters. My next review will be for the direct to video and DVD films in the series, and trust me, I have a lot to say about them. Keep a look out for it.